When I was 16, while I studied at cookery school, I started to work at the restaurant in Arezzo where I came from, cooking steak for a few years. After that I was at the 5 star hotel in Firenze, Sofitel Firenze, as a cook for 2 years. I always wanted to see what the rest of the country was like since I was young; so I left Italy and I went to Antigua Barbuda. I worked at an Italian restaurant as a pasta chef (making all different types of fresh pasta) in there for 6 months. I first visited Australia on a holiday for 6 months, I had such a good time I decided I wanted to stay. 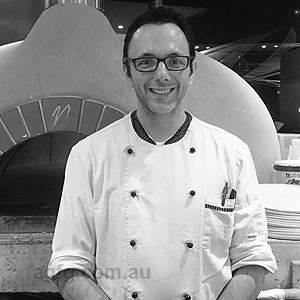 I started work at Wild Fired Circular Quay and moved around several different restaurants before becoming Head Chef at Dolce Ristorante, located in Martin Place. I worked there for 5 years as well as La Casa and Fratelli Fresh as a Sous Chef. I had numerous working experiences at various Italian restaurants In Australia and I was wishing to have my own kitchen, using my own recipes. Yes, I have since I was young. I started to cook when I was 11. I am trying to cook Italian mum’s food. Trying to serve the right authentic Italian flavour. I put my love into my cooking and enjoy the appreciation people have for this. Flour + salt + yeast + oil and water = bread. Homemade Pappardelle with Beef Ragu. Search "Stefano Frangipani" in our recipe section for the recipe!